Being on vacation and getting up earlier than I do while I'm at home just sounds crazy. I love to sleep and already have difficulty getting up most mornings so this sort of thing always sounds a little strange for me to do. Despite this, ADW and I get to the lobby and meet our guide, Valdi, who tells us about the tour planned for us today: a drive through about 2 hours east of Reykjavik to Eyjafjallajökull, then a little further east to the Sólheimajökull glacier; specifically to a tongue that extends down from its mother glacier, Mýrdalsjökull, Iceland’s fourth largest. The tour is expected to get us onto the ice field and learn about the glacier itself and the effect of the Eyjafjallajökull eruption in 2010 on the glacier and its surroundings. 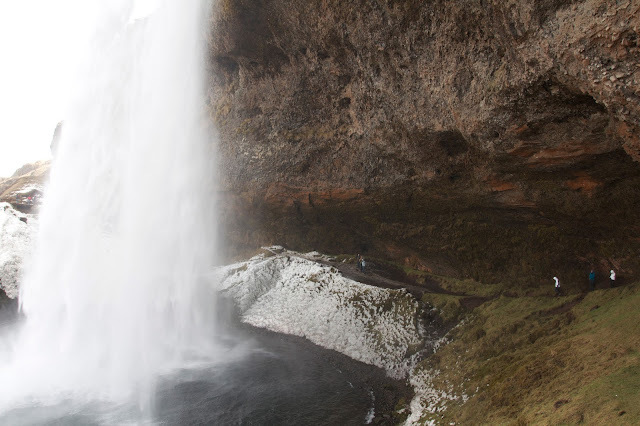 We are also expected to make stops at the picturesque waterfalls of Skógafoss and Seljalandsfoss. 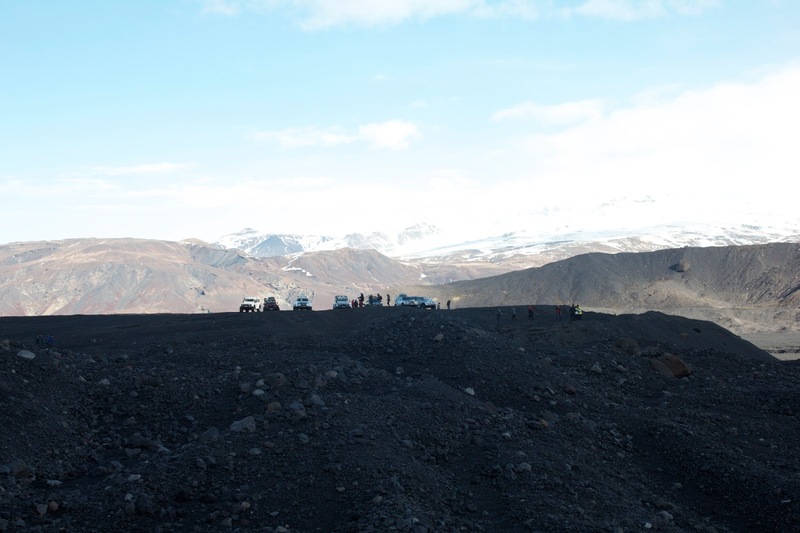 The first notable stop is getting off the paved road to make our way to the (in)famous Eyjafjallajökull (to Americans, e-16) which erupted in 2010. Here, we see the remnants of the glacier and glacial lagoon that used to be found in this area. This stretch of the trip is our first taste of what a super jeep can do. We make a stop to stretch our legs while our guides deflate the giant bubble like tires so that they have more control while driving over the pot-holed terrain. We're told that when the eruption started, it blew off part of the glacier on top of Eyjafjallajökull and then filled in the lagoon--we are basically driving over the former lagoon! We're all standing on-top of where the glacial lagoon used to be and that is what's left of the glacier! 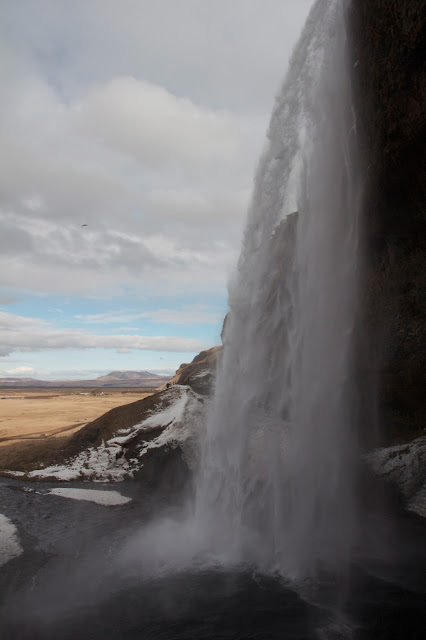 Following this, we visit one of the most beautiful and best known waterfalls of Iceland, Seljalandsfoss. This falls is beautiful and you can get close enough to walk behind the falls for an unforgettable experience. You can walk behind the falls! 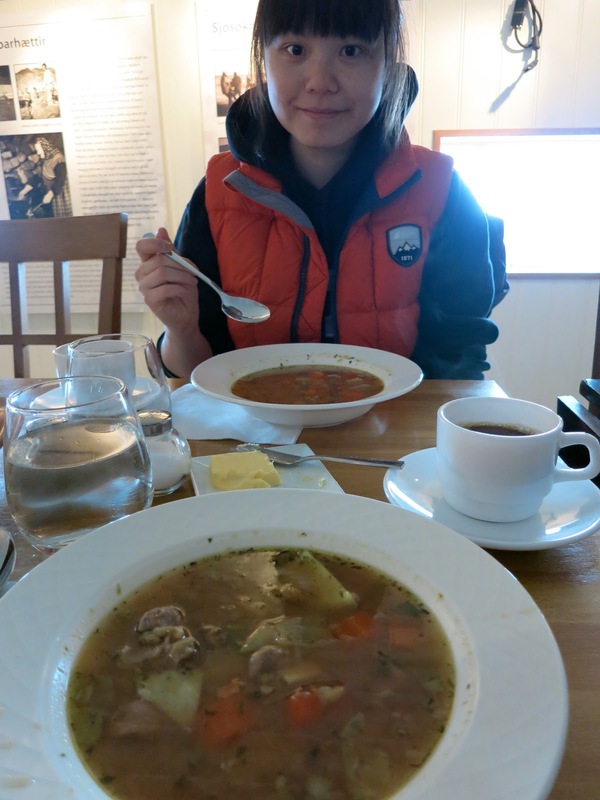 We stop for a short lunch at the Country Hotel Anna where we are served meat soup with coffee. This is truly a delicious meal to warm the body and soul after wandering around the cold outdoors. Meat soup is a hearty Icelandic soup made from lamb and is similar to the beef and barley vegetable soup back home. The thing is, it's better. Can you tell I'm really happy? 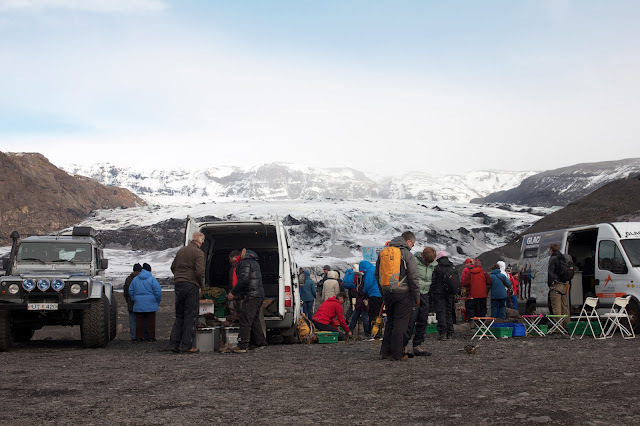 Following lunch, we head out for our glacier walk on the Sólheimajökull glacier. 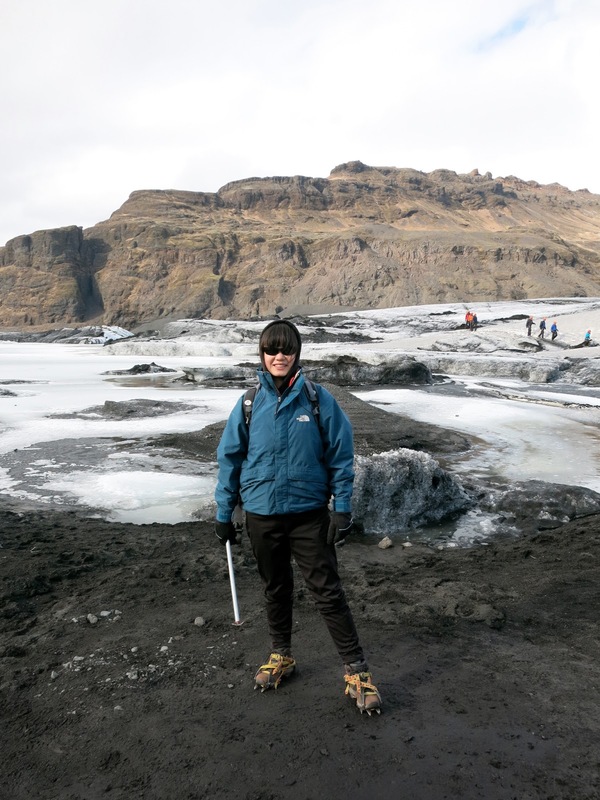 This is one of the smaller glaciers of Iceland and it measures about 7km across. 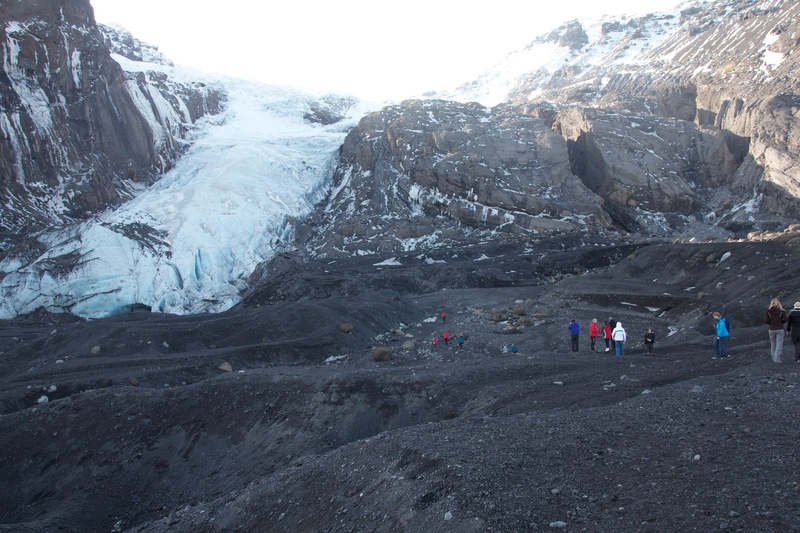 At first glance, the glacier doesn't really look like a glacier because it's covered in a black soot--volcanic ash from the 2010 eruption. When we get our spiky crampons on, it's noticeable when you crunch into the ice and just stick. 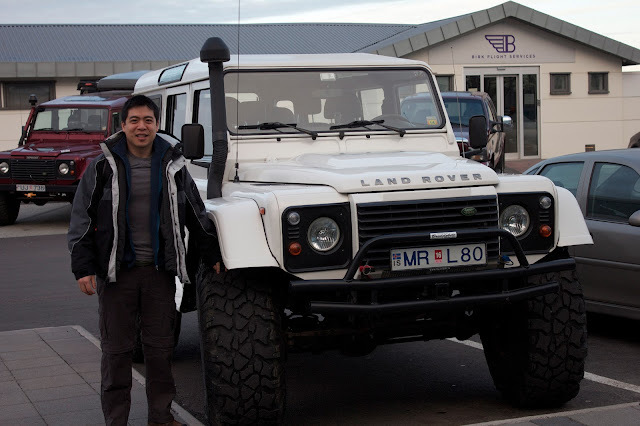 I'm ready to head out onto the glacier! Our next stop is the last waterfall we'll be seeing on this trip, Skógafoss. This waterfall is thought to have been surrounded by a small forest but by now, it's treeless, like the rest of Iceland. I couldn't resist. He reminded me of a miniature Aspen! 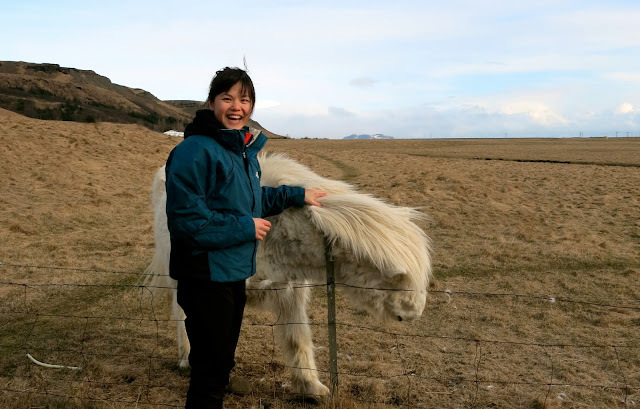 As our last treat on this excursion, Valdi takes us to the South shore to stare Antarctica straight in the face: we are facing directly south, on the black ash beaches of Iceland. Doesn't this photo make you want a super jeep too? That closes our excursion walking on volcanos and glaciers for the day and leads us to a casual dinner at the Sea Baron (Sægreifinn) fisherman's hut. This place is very informal and their menu is a live menu where you pick the skewers of fish or vegetables you want. They're famous for their lobster soup which is simply delicious. For anyone who's curious, the whale is just delicious. It's got the consistency that is a cross between beef and good tuna. The taste is similar to beef with a hint of fish and the texture is a soft and lean beef. It's some of the best meat I've had since coming to Iceland. LOVING all the pictures! So glad you're able to blog a bit while you're away!! Sounds like it's amazing so far!